Deciding to renovate a home is a huge undertaking, especially when it’s your first home with your beloved bride. Some projects are best left to the most adept professionals, for efficacy, your wallet and most importantly, your marriage. But Jake Halpin gives everything he has to all undertakings, which is why he’s such a successful realtor and property developer at Muve Group. The finished product was a completely remodeled four-bedroom, three-bathroom condo within the mountainside community of ‘Three Fountains’, adjacent to a pristine golf course and without a decorative care in the world. Talk about loving where you live and keeping it in the family. Jake’s father-in-law is credited for finding the property, as he already lived within the Murray complex. He learned of the unit’s availability and quickly informed his daughter and Jake, who jumped at the opportunity, settling in record time and moving in for what they hoped would be pure, wedded bliss. Before too long, Jake’s capable and very handy father, Bob (the Builder)… [we couldn’t resist] was visiting more regularly than most fathers do, to help out with a big project – renovating the ‘love nest’ with his number one son. 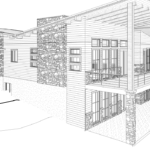 Inspiration for the Halpin revival was drawn from a ‘best of’ collective from diverse property listings Jake has been privileged to view and represent over the years as an established Salt Lake City-based realtor. The Halpins were very particular with selecting high quality elements and features for the design, as they had initially planned to remain living there. An open concept kitchen and living area is the home’s striking focal point, and Jake cites the white quartz waterfall countertops and “attention grabbing” timber accents beneath the countertops as a design idea beautifully coming to fruition in revival. 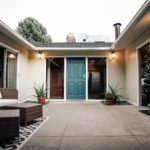 It’s also difficult to believe that the basement was once an empty shell after viewing the finished images, and the enclosed timber-clad courtyard is brimming with potential. The Halpins had hoped to include a built-in barbeque and wet bar for salubrious summertime hangouts, but the property sold beforehand – an excellent position to be in as a property developer. We’re all about mid-Century modern design at the Muve Group, and the Halpin property featured quite the boon – paisley countertops! Forever our ‘silver lining’ guy, Jake was partial to their unique look, even toying with the idea of fashioning a small dining or coffee table with the now excess material, but Jake is also aware of the wise adage, ‘happy wife, happy life’, so he quickly nixed that idea and focused on more pressing matters, such as completely remodeling the home, particularly the dark upstairs areas which lacked any overhead lighting. Interestingly enough, this renovation project resulted in 104 visits to Home Depot. To be clear, Jake is meticulous by nature, but he wasn’t counting his visits from the get-go. He became curious at the project’s completion, as he was adamant that the tally would be closer to 300 visits, because it sure felt that way to him! 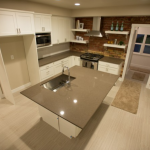 Visiting the hallowed ground of all things construction, including multiple visits on any given day is an experience shared by all DIY and professional renovators. Most building suppliers now offer a similar reporting/tracking service that monitors customers’ visits and their expenditure. It’s a convenient tool for budgeting and future projects. The stunning Halpin home listed, and was under contract before the week was out and is now owned by an appreciative woman with deep roots in the city of Murray. With their first family project ‘done and dusted’, the Halpins happily share their key learning, which is to remain realistic with project planning versus real timelines. As Jake so humbly notes, “We missed EVERY single deadline, adding to DIY’s sometimes woeful construction statistics.” For the sake of impartiality, the kitchen primary wall was intended to be a load bearing wall, but it was soon discovered that the wall was unable to withstand such weight. This resulted in a major blowout to design, planning and timelines, but it also led to the home’s now open concept design, which is its greatest feature. Silver linings remember! 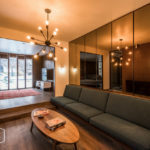 If you fancy undertaking a similar project, or you’d prefer a Muve-in ready knockout, call Jake on 801.910.1571 today and view Muve Group’s long list of unique homes throughout Salt Lake City and beyond.